Spruce Grove Alliance Church is building a spiritual home for the people of Spruce Grove and Parkland County. To meet the needs of today, and to enable us to support our growing communities into the future. Read the background behind this project here. In September 2018 we had approximately $1,250,000 in cash raised for this project – 62.5% of the $2 million required to start construction of Phase 1 of our building project. So we separated the utility upgrades out of Phase 1, and “went underground”; creating a bite size project. The utility upgrades - estimated to be around $750,000 - have always been a part of Phase 1 planning, and the $6 million total budget. As of March 31 we are $130,000 away from reaching that $750,000 goal – and by extension, having the $2 million in cash on hand necessary to start construction. 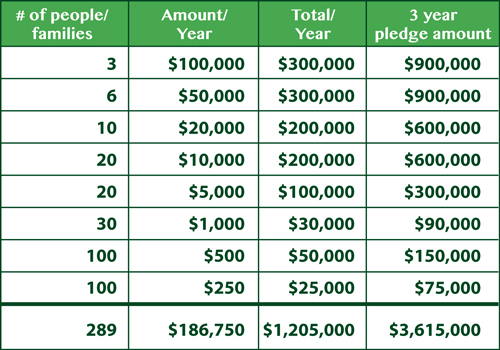 With the first part of the Alliance District’s financing guideline (1/3rd cash on hand) close to being met, we turn our focus to the second part of the district’s requirement: securing 1/3 of the total project cost in pledge commitments over a three year period. In the past 21 month we have raised over $800,000 per year – so this goal is not unreasonable. And if we are successful, after three years we will be close to paying for most of the anticipated expenses of this project. This means reduced – or even no debt - when the Education Centre is complete! Discussions with ministry leaders as well as tours of other facilities have allowed us to begin planning how to best design our Education Centre. These conversations will continue as we seek to maximize space and the effectiveness of the building. And we are planning a number of opportunities for volunteers, leaders and all those who will use the facility to participate in the site design. Remember that this is still in concept phase and what we end up with will look different – but we hope you will share in our excitement at seeing what the plan could look like. In an effort to reduce the disruption to our regular programs, it was determined that summer is the best time to begin the necessary utility upgrades. Summer also provides the best weather (hopefully) for this type of construction. For these reasons the board has provided approvals for our team to move forward with the utility upgrades starting this spring. As such, a development permit has been submitted to the city. We are also beginning the process of gathering bids for the proposed work. Do not be fooled – the utility upgrades will be messy. Like every construction project there will be dirt and mud; parking will be a disrupted; and we’re likely to face unexpected challenges. But we will keep our eye on the future and look forward to a smooth parking lot, dependable utility services and room to grow well into the future. Questions? Visit the background and history of this this project and Phase 1 here or read through the Frequently Asked Questions here.